I take this opportunity to again thank you for meeting with me and considering my candidacy for the state senate. While the results were less than what I had hoped for, I knew the race would be very competitive. All four candidates were strong, and represent the best of what we as a party can offer the voters. I have said from the beginning of this process that I would be comfortable with the results and would support the winner. The precinct committeemen have spoken, and though I have learned a lesson in life that what is meant to be will be, I take solace that things always happen for a reason. Scott Schneider is a good friend, an excellent father and a good businessman. He will make an excellent state senator. I will do all in my power to help Scott in his new role as our state senator and will help as many Hoosiers as I can along the way. The challenges before us as a state, a community and as a family are simply too grave for us to spend time and energy elsewhere. Please join me in congratulating Scott and wishing him and his family well. I also want to congratulate Ryan Vaughn and Chris Douglas. Both are excellent men and true public servants. As I have said before, there were no losers on election night. I am deeply troubled, however, about the recent actions and comments made by some in our party. The Marion County Republican Party has an obligation to lead and conduct itself in the fashion of great leaders from Lincoln to Hudnut to Reagan. It is my hope that all who were associated with last week’s caucus can put aside any personal motives and come together behind Senator Schneider. We will not be successful if we are a party divided; rather we need to come together, be as inclusionary as possible and see the best in all. As always, I will be working to improve the lives of Hoosiers. Should you wish to meet again for any reason, I am always up for a cup of coffee and willing to help. You may contact me at johnruckelshausr@aol.com. Again, I congratulate Scott and wish him the best. If anyone thought Ivy Tech President Tom Schneider was going to end the long-time practice of the credibility-challenged community college hiring political cronies for high-paid positions at the school, they were sadly mistaken. An Advance Indiana reader brings to my attention two recent hires by Schneider, one Democrat and one Republican. These two new hires join a staff that includes former Senate President Pro Tempore Robert Garton (R), Speaker of the House Pat Bauer (D), State Rep. Bill Crawford (D), State Rep. Craig Fry (D) and Susan Brooks, wife of Marion Co. GOP enforcer David Brooks. Brian McGrath, former finance director for the Indiana Republican Party and Finance Director for Gov. Mitch Daniels' campaign committee, has been hired for the position of Vice President of Workforce and Economic Development Partnerships where he reports to fellow big-shot Republican Susan Brooks. McGrath has a Bachelor of Arts degree from Indiana University. Ivy Tech also hired J.D. Lux late last year for a newly-created position of Executive Director of Government Affairs. Lux is an unsuccessful Democratic candidate for state representative and former Caucus Campaign Director for the Indiana House Democratic Caucus where he reported to another fellow Ivy Tech employee, House Speaker Pat Bauer. Lux earned a law degree from Ohio Northern University's Petit College of Law and a bachelor's degree from Franklin College. Yes, we still hold Ivy Tech in low regard. Yes, nothing has changed under Schneider. And yes, there needs to be a comprehensive investigation undertaken of the college. The quid pro quos taking place there without any consequences are well over the top by this point. They know there are no prosecutors willing to take them on in this state at either the federal or state level so they do as they please. It would be nice, though, if the Indianapolis Star or some other mainstream news organization would at least take a stab at disclosing the political chicanery taking place at this pretend college at taxpayers' expense. Oh, that's right, they hire them too. Doesn't radio talk show host Abdul Hakim-Shabazz have a part-time teaching gig there as well? I don't seek to advance the re-election of U.S. Rep. Dan Burton, but when people in the media like the Star's Matt Tully are framing the political debate in his race, he might just manage to pull off another term in the House of Representatives. Commenting on Burton's co-sponsorship of congressional legislation that would require candidates for president to file proof of their constitutional eligibility to hold that office, Tully writes in his column today, "How else can we explain Burton's decision to jump into the ridiculous and mean-spirited debate over whether President Barack Obama is a U.S. citizen?" Tully's assertion is categorically false. Instead of engaging in drive-by political attacks on persons with whom he disagrees, Tully instead should be focused on the real issue at the heart of Burton's legislation: Should a candidate for the highest office of these United States be required to produce evidence that he meets the constitutional requirement of being at least 35 years of age and is a natural born citizen. Oddly, Tully apparently thinks you should be required to produce more evidence when you go down to the BMV branch to get a driver's license than a person should be required to produce when they run for president of the United States. Like most of the mainstream reporters and others who have offered opinions on this subject, Tully has not bothered to read the U.S. Constitution's eligibility requirement for president of the United States or conduct any research on what the requirement that a candidate be a "natural born citizen" means, let alone pick up the phone and speak to someone who has researched the issue. Repeatedly, pundits like Tully assume that "natural born citizen" means the same as "citizen". I have explained in many previous posts on this blog that the two terms are far from being synonymous to one another, but the drive-by political attackers like Tully would rather trivialize and marginalize persons who have done their homework rather than engage in a serious constitutional debate. "When Barack Obama, Jr. was born on August 4, 1961, in Honolulu, Kenya was a British colony, still part of the United Kingdom's dwindling empire. As a Kenyan native, Barack Obama, Sr. was a British subject whose citizenship status was governed by the British Nationality Act of 1948. The same act governed the status of Obama, Sr.'s children." The Constitution does not, in words, say who shall be natural-born citizens. Resort must be had elsewhere to ascertain that. At common-law, with the nomenclature of which the framers of the Constitution were familiar, it was never doubted that all children born in a country of parents who were its citizens became themselves, upon their birth, citizens also. These were natives, or natural-born citizens, as distinguished from aliens or foreigners. Some authorities go further and include as citizens children born within the jurisdiction without reference to the citizenship of their [88 U.S. 162, 168] parents. As to this class there have been doubts, but never as to the first. For the purposes of this case it is not necessary to solve these doubts. Contrary to the view asserted by many that the 14th Amendment made all persons born within the U.S. natural born citizens regardless of their parents' citizenship status, this opinion suggests the 14th Amendment's application is limited to a person's status as a citizen. Why else would the Court say that "resort must be had elsewhere to ascertain that" if the 14th Amendment had any applicability to a person's status as a natural born citizen? The words “natural born citizen” do not appear in the statute discussed by Mr. Taranto. In fact, the words “natural born citizen” do not exist in any US statute. Those words only appear in the Constitution - Article 2 Section 1 – and only as a requirement to be President . . . The statute does not use the words “natural born citizen”. Mr. Taranto needs to get back to Hogwarts fast and try a new spell. His magic wand didn’t add new text to the US Code overnight. Had Mr. Taranto made the focus of his article the issue of whether persons who obtain citizenship at birth by statute are also natural born citizens for purposes of meeting the Presidential requirements of Article 2 Section 1 Clause 5, such a discussion would have been proper. His legal analysis as stated in the article would be wrong, but stating such a question presented and taking a position thereto is a correct form of editorial. But that’s not what Taranto has done. Taranto and The Wall Street Journal have done something far more damaging and nefarious than simply mis-analyzing the law. He’s written – and they’ve published – a piece of propaganda here which makes it appear as if the text of the law contains words which are not there. Let’s call that what it is – propaganda. They weren’t content to ask a legal question and honestly deal with both sides of the argument from a non-partisan and pure journalistic intent. No. This article is an attempt to trick readers into believing laws exist which do not exist. The statute does not include the words “natural born citizen”. Regardless, those who read Taranto’s article are left with the impression that the statute includes those words. And that is journalistic evildoing personified. "Shall we expect some transatlantic military giant, to step the Ocean, and crush us at a blow? Never!" declared Abraham Lincoln in an 1838 address, given when the United States was much smaller, much weaker -- and much freer -- than we are today. "All the armies of Europe, Asia and Africa combined, with all the treasure of the earth (our own excepted) in their military chest; with a Buonaparte for a commander, could not by force, take a drink from the Ohio, or make a track on the Blue Ridge, in a trial of a thousand years. At what point, then, is the approach of danger to be expected? I answer, if it ever reach us it must spring up amongst us. It cannot come from abroad. If destruction be our lot, we must ourselves be its author and finisher. As a nation of freemen, we must live through all time, or die by suicide." Robert Nelms stood accused of draining off $27 million in cemetery trust funds from Indiana cemeteries after purchasing Memory Gardens Management Corp. five years ago. Today, the Marion Co. Prosecutor's office entered into a plea agreement with him that allows him to avoid any jail time for his crime. "As part of his deal, Nelms would avoid prison, instead receiving an eight-year sentence to community corrections programs and two years on probation," the Star's Jon Murray writes. "If convicted of all of his half-dozen charges at trial, he would have faced a maximum 10 years in prison," he adds. Nelms and his wife, Debora Johnson, originally faced five felony counts of theft and securities fraud charges. The prosecutor's office earlier dismissed all charges against Johnson in consideration for her agreeing to testify against her husband according to Murray. Also, David Bechens, a Nobleville bank officer who served as the trust officer for these cemetery funds, reached a similar deal for agreeing to cooperate with prosecutors. Who was Nelms' attorney? Why, of course, it was Jim Voyles. I don't know how our public defenders in this county can stand to do their jobs when they see the way the criminal justice system treats their clients in this county compared to criminal defendants who happen to be politically-connected, or who have the money to pay for services of a highly-compensated attorney like Jim Voyles. The disparity in sentencing is staggering. So much for all that stuff they teach us in law school about equal treatment under the law. 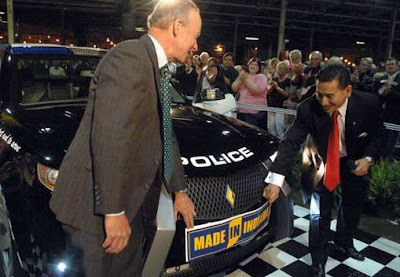 Carbon Motors will build the first purpose-built law enforcement patrol car, and it has chosen Connersville, Indiana as the site to invest $350 million in a manufacturing plant that will employ 1,550 workers. It looks like there are many details to be worked out to make the new plant at the former site of bankrupt Visteon a reality, but the announcement today by Gov. Daniels and Carbon Motors CEO William Li before a crowd of more than a 1,000 local residents gave the town something to cheer about for the first time after a long string of economic setbacks. Photo credit of Gov. Daniels and Li to the Richmond Palladium-Item. I'm glad I didn't waste the time to go over to the City-County Council meeting tonight to listen to more than three hours of BS from high-paid downtown elites who've been doing the same song and dance for the past couple of decades that got the CIB in the financial mess it's in today, and each of whom has a personal financial stake in the outcome. There was absolutely no opposing, substantive testimony allowed at tonight's council meeting by the Rules & Public Policy Committee Chairman Robert Lutz, and I'm not talking about the handful of citizens who were allowed to provide rushed statements near the end of what turned into a more than 4-hour meeting or the excellent presentation Sean Shepard made on behalf of the Libertarian Party, although he drifted away from the central issue later in his discussion. Despite the yeoman's work blogs like this one have done to try to inform the City-County Councilors on this topic tonight, I didn't hear a single good question from a single member of the committee tonight. These people are hopeless. On a voice vote motion, the Committee voted to advance a proposal that everyone concedes is at best a band-aid solution to the CIB's financial woes. Councilor Angela Mansfield (D) cast the only dissenting vote. Contrary to Chairman Lutz' comments tonight, this proposal is not about a single increase in the hotel tax. It sets in place the wheels to borrow and spend another $27 million the CIB has neither justified nor has any way of repaying short of more tax increases by 2013. I can only conclude that CCC President Robert Cockrum is totally shameless. His son is an executive at White Lodging and his hotel under construction, the J.W. Marriott, is a direct beneficiary of tonight's council action. He participated in the debate and supported the resolution. I've long since given up on members of the City-County Council adhering to any sense of ethical propriety so I can't say I'm surprised by his actions tonight. I heard councilors falsely claim that they are given no other choice than to pass this lousy proposal or let the CIB reach a point that it is no longer able to operate the facilities and begin cancelling conventions. The CIB doesn't own Lucas Oil Stadium. It doesn't own the expanded convention center facility. The state of Indiana owns both. If the CIB cannot afford to operate these state-owned facilities, it seems pretty simple that the CIB needs to turn back over one or both of these leased facilities to the state. That doesn't require closing facilities. That doesn't require cancelling conventions. That doesn't require raising taxes. That doesn't require borrowing more money. And it doesn't jeopardize the City's bond rating. It does require having common sense and, unfortunately, nobody on the council seems to have any common sense. Bankrupty is an absurd suggestion, and I wish Ed Coleman and others would stop making a complete fool of themselves by beating that dead horse. And for those of you who doubt the viability of my idea from day one to turn LOS over to the state, you may be interested to know that some of Mayor Ballard's closest advisers urged him to do just that. The only reason he didn't go forward with it was because certain attorneys with a vested interest in protecting their legal work represented that the CIB could not legally do that. To them I say, baloney. If Mayor Ballard had followed my wise counsel, he would have put this monkey back on Gov. Daniels' back where it belongs and bolstered his own standing with the good citizens of this county. One final comment on tonight's hearing. I heard one councilor after another beating the drum that somehow or another Marion County residents are getting a raw deal and have to give more to the State of Indiana than it gets back. That claim could not be more inaccurate. The reality is that Marion County makes off like a bandit when it comes to enjoying the largess of the State of Indiana. Taxpayers across the State have pumped billions into this county over the years. Thousands of state employees are amassed in the county. Thousands more are based here to lobby and represent interests of hundreds of trade associations based here by virtue of our capitol city status. Large amounts of privately-owned real estate is leased from Marion Co. property owners to house the activities of these employees. State taxpayers have helped finance our sports palaces and our Circle Centre Mall. They've helped build expansive highways, bridges, streets, sidewalks, canal and sewer improvements. No other county in this state does as well as Marion County when it comes to state funding and support. I hear about all of these employees from the suburbs coming to the City and taking their tax dollars back to their suburban counties. Has anyone noticed how many people are now commuting out to the suburban communities from Marion County for employment who bring their tax dollars back to this county? Give me a break. Enough of beating this dead horse already. It has taken nearly 16 years for current and former state employees to recover wages they claim they were owed by the State of Indiana. At issue in the lengthy litigation were state workers who were required to work 40-hour weeks for the same wages as other state employees who worked 37.5-hour weeks. The state ended that practice in 1993, making all state employees subject to the shorter work week. After a 4-day trial, Marion Superior Court Judge John Hanley ruled in favor of the class action plaintiffs, awarding them over $42 million, the largest class action award ever against the State of Indiana. The award affects as many as 15,000 current and former state employees during the pay period of 1973 to 1993. I know one one of those retired state workers who is looking forward to recovering his lost pay, and I'm very happy for him. Hopefully, he and the others won't have to wait years more to recover their back wages. The State of Indiana could use that additional $8 million more it has pledged to hand over to Indianapolis' CIB to pay this obligation, assuming the City-County Council approves the tax, borrow and spend scheme before it now. This is a case where administration after administration just kept kicking the can down the road instead of addressing this legitimate issue years ago. The chickens have now come home to roost. The Indiana Law Blog has more on today's ruling here, along with a copy of Judge Hanley's Order here. Susan Bayh may be valued by WellPoint for her "experience, perspective and the many contributions she has made," as a spokesman for the nation's largest health insurance company tells us. But she wasn't valued enough by WellPoint or a string of other health-care companies to be invited onto their boards until her husband had a U.S. Senate election in hand. Now that Sen. Evan Bayh approaches a heavily-solicited vote on historic health-care reform, the public is asked to believe that the more than $2 million his wife has earned from these special interests is irrelevant to his thinking. To say we find that hard to believe is not to impugn the senator's integrity or commitment to the interests of his constituents. Granted, he can point to votes he has cast that have disappointed the health-care industry, which gave him more than $500,000 in campaign money in 2008. But at the same time, lobbies do not hire the relatives of lawmakers in order to buy neutrality. For WellPoint and Sen. Bayh to make a point of not having had contact on legislation that could alter the company's future is at best disingenuous. Access is a given, and so is conflict of interest. This particular form of conflict is not confined to the Bayhs. Nor is the posture of cluelessness about its effect on voter confidence. As The Star's Daniel Lee detailed Sunday in his story about the Bayh connection, some of the Senate's most prominent members and former members have played key roles in legislation affecting their families' business interests. The way of the world? To some extent, yes. Elected officials cannot be expected to break all ties with their previous lives -- or to spurn the call of the lobbying industry when they return to private life. Yet, they could burst the limits of Beltway imagination and reject plum positions for spouses that clearly come with strings attached. Or their spouses could do so on their own. Annette Shelby accomplished that very thing a few years ago, resigning from an aerospace company board because she felt it would look bad inasmuch as her husband, Sen. Richard Shelby, R-Ala., sat on a defense subcommittee. In this troubled economy, there's even more reason to question political board appointments, especially multiple ones such as Susan Bayh's. Critics say such members lack the competence or at least the time to do the challenging work of overseeing their companies, raising the risk of misdirection and even ruin. Bad business, in short, all the way around. DUMEZICH WON’T RUN: Former state representative Dan Dumezich confirmed that he will not run for the U,S. Senate (Howey Politics Indiana). Asked if he was running today, Dumezich e-mailed a one-word answer: “Nope.” That leaves Don Bates Jr. and State Sen. Marlin Stutzman in the Republican field to take on the two-term senator with a $12 million warchest. He initially told Howey Politics that he would make up his mind by last February. A one-word e-mail from Dumezich this morning was misinterpred by HPI that he would not run. Howey didn't include the direct text of the question he posed to Dumezich so it's hard to ascertain whether his misinterpretation of his original answer was understandable. Somebody named Don Bates, Jr. announced a run for U.S. Senate this weekend. According to his hometown newspaper in Richmond, Bates is a banker, a Republican, and he didn’t get an endorsement from the local Wayne County GOP Chairwoman. The Bates announcement at the Wayne County Fair is no surprise to political insiders. Bates campaigned recently at the state GOP Dinner. But his approach is hardly conventional. A Saturday announcement with just one appearance on the border of another state and no statewide news release is not a recipe for success, especially for a guy with no name recognition to speak of outside Richmond. By the way, Evan Bayh (the Democrat Bates hopes to unseat) gets the headline on the Richmond Palladium-Item website this morning. While Shella jumps on a headline Bayh got in Bates' hometown newspaper today, his reporting completely ignored the damning front-page story in the state's largest newspaper discussing the serious conflicts of interest posed by Sen. Bayh's wife's presence on so many publicly-traded corporate boards, including four with an interest in the current health care debate. True to form, Shella mocks and berates ordinary citizens' exercise of their right to run for public office. Shella is such an insider's political reporter. Does he get joy in tearing down people on behalf of the well-heeled insiders? Does he see it as his job to winnow the field of candidates to only those who meet with the approbation of his insider friends? I don't know Don Bates, Jr, but I sure as heck don't think political reporters should come out attacking the guy on day one just for saying he's going to be a candidate. That being said, I continue to be perplexed by the board’s recent decision to relieve me from my responsibility as CEO of the enterprise. To date, I have not received a reasonable explanation as to why; the statement they released to the press not withstanding, I feel as though after 20 years I am entitled to one. I understand that maybe they don’t feel that they owe me an explanation. One thing I can tell you is that I stood resolute in my conviction on the direction we needed to go and that the measures we have taken since January are only a beginning. A complete review of how we are structured and operate is necessary. Beyond my being dismissed, I am unaware of any changes that are being contemplated that will have a meaningful impact on the organization. I have been replaced in my role as manager by two individuals who have been with the company for many years. In that time they have also been members of the executive management team and have participated in all of the strategic decisions that have been made over the last 15 years, so they are well aware of the challenges ahead. My question for the board has been not one of who is going to manage the company, but rather, who is going to lead it? There is a distinction. George still sits on the Board of Directors with other family members, including his mother, Mari Hulman-George, who chairs the board, and his sisters. Attendance at today's Brickyard 400 apparently weren't so hot. Now that has a major economic impact on the Indianapolis hospitality industry, but don't expect to hear any concerns expressed by the downtown elites, who are totally consumed with the payola scams for the Simon's Pacers and Irsay's Colts, which don't even come close to matching the economic impact of the Indianapolis Motor Speedway. The IMS receives no public subsidies. Indiana's Stonewall Democrats are hosting a fundraising reception for former State Rep. David Orentlicher on August 16, 2009 at a private home to support his bid for Marion Co. Prosecutor. The invitation from Zach Adamson describes Orentlicher as a "tireless social justice advocate and consummate public servant." Are any other Democrats planning to enter the Democratic primary? Some observers speculate that the Carson crowd might not be really excited about an Orentlicher candidacy given that he challenged Andre Carson in last year's special election caucus and the May primary election. Still no word on the Republican side as to whether Carl Brizzi plans to seek re-election to a third term. A competent Republican opponent to Bayh in next year's Senate race could send Bayh packing if he or she only used issues like this to demonstrate that Bayh has been more interested in using his position in government to parlay millions for his family than representing the people of Indiana in the Senate. Anyone who knows Susan Bayh will tell you that it is a complete joke to think of her as being a competent choice for these public companies to choose to sit on their boards. If she's not taken seriously as a businessperson by the Bayhs' closest friends, why should these public companies be putting her in such an important role? The answer is influence and everybody knows that. Sen Bayh is essentially prostituting his wife for personal financial gain. Lee's story indicates that a board member is expected to devote 20 to 30 hours of time a month. "That means Susan Bayh's current six current board seats could consume up to 180 hours a month," Lee writes. I'll give you a hint. She doesn't spend anything close to that amount of time on the work for these boards, unless you include the time she spends shopping for new clothes, getting her hair styled and primping in front of the mirror. As the E.D. of the LPIN, I want to make it clear that Liz Karlson has not, and is not, a member of the Libertarian Party, it's Indiana affiliate, or of Marion County. She never offered to join, and we did not ask, because she is committed to growing the Republican Party, and the Republican Liberty Caucus. Liz has worked diligently in organizing the Republican Liberty Caucus, and has been picking at our membership to recruit for the Republican Party. We allowed this for two reasons: A. No one wanted to go back. And C. We are good friends with Liz. We are comfortable enough with ourselves to hang out with members of another party. To anyone who asks why Libertarian Party members don't work from within the two old parties for reform, here are your answers. I have said for years that Libertarians pose a significant threat to the future viability of the Republican Party in Marion County. I've offered a number of examples in the past where close races were lost by Republicans in which a Libertarian candidate drew more support than the losing margin of the Republican candidate in the race. Marion County has been trending Democratic for years, and there is simply no margin for error. Spangle's comments are dead-on with respect to Karlson's efforts to attract Libertarian-leaning persons into the party. Brooks' move against Karlson is a setback in attracting those people that the Republican Party desperately needs to bring into the party. It is my suspicion that the party's decision to dump Karlson and another ward chair, Eric Smith, has more to do with their support of Scott Schneider over Ryan Vaughn, the party's candidate, in this week's Senate District 30 race to replace Sen. Teresa Lubbers. Fellow bloggers Scott Fluhr and Paul Ogden have more on that here and here. I would add that Brooks' e-mail specifically denied this as a reason for his decision, and he copied now-Sen. Scott Schneider on the e-mail he sent to Karlson. People like Karlson had become very disillusioned with Lubbers, who had become aloof and non-responsive to many of her constituents. Not surprisingly, Karlson and other like-minded Republicans found Libertarian candidate Steve Keltner an attractive alternative in the last election. Keltner has since joined the Republican Party thanks, in part, to Karlson's efforts. What I find perplexing is the differing treatment of persons within the party on the so-called issue of loyalty. The Marion Co. GOP leadership itself refused to aid the election of three of the at-large candidates for City-County Council in the 2007 municipal election despite the fact that two of them were slated by the party. Party leaders reasoned that by supporting only Kent Smith, an African-American, it could lure a sufficient number of African-American voters to scratch their straight- ticket ballots in the at-large council races and, by doing so, cancel out their votes for the four at-large Democratic candidates. While party leaders may think that racist strategy secured the wins of two other at-large council candidates, Ed Coleman and Barbara Malone, also an at-large African-American candidate, the truth is that it only succeeded in costing the Republicans a seat on the council, a seat that could have been held by the fourth at-large candidate, Michael Hegg. Since the election, Ed Coleman left the party and became a Libertarian. There has also been concerns expressed that Democrat-turned Republican Malone could return to the Democratic Party fold, leaving the council evenly split between Republicans and Democrats and giving a tie-breaking vote to Coleman. There are countless examples of high-ranking members of the party who openly dissed Greg Ballard's candidacy and even supported the re-election of Bart Peterson. The county chairman, Tom John, was among those dismissing Ballard's chances right up to end of the race. One City-County Councilor, Scott Keller, endorsed Peterson's re-election, attended his fundraisers and voted for his tax increases in an election year. Immediately after the election, the Republicans appointed Keller to the coveted Metropolitan Development Commission. Keller had also served as a precinct committeeperson for many years. He neglected to file for a spot last year, but the party appointed him to a vacant position anyway despite his support of Peterson in the prior election. Keller was on hand at Tuesday night's caucus to boost Ryan Vaughn's candidacy. If the party's decision to fire Karlson and Smith had anything to do with party loyalty, their definition of loyalty is a rather strained one I must add. Have some of us been highly critical of Mayor Greg Ballard? Absolutely, but our views are based on his failure to carry through on key pledges he made as a candidate. Those failures have weakened his support significantly among the core constituency that put him in office. The message in these firings could not be more clear. The party is not interested in people who participate in the political process to further a public policy agenda that they believe is most compatible with the guiding principles of the Republican Party. They only want people who are job-seekers or government contract-seekers who they can control. Participation in politics should be reserved for their professional political class only and everyone else should just go away. It's that attitude within both political parties that has contributed to the eroding trust people have in their government and their elected officials. God forbid anyone within the party be capable of thinking for him or herself. The City of Indianapolis this past week issued a Request for Expression of Interest to "solicit the broadest array of approaches and ideas that will allow the City to produce finished drinking water, process wastewater and provide related infrastructure services in the most efficient and cost effective manner and to help the City satisfy the USEPA and Court mandated capital improvements in a manner that mitigates the affect on ratepayers." This comes on the heels of a blistering IURC order approving an emergency water rate hike that gave a scathing assessment of the City's current privatization agreement with the French-owned Veolia. According to the RFEI, the City expects to incur over $4 billion over the next 15 years to upgrade its waterworks and wastewater systems. In order to cover these costs, rates for water and wastewater services are projected to rise 112% and 427%, respectively, over the next 15 years. The RFEI contemplates creating a combined waterworks and wastewater system through a governmental or non-profit structure to realize significant savings in the growing capital and operating budgets of the two separately-run systems. A 5% savings, for example, could yield $175 million in savings. United Water currently operates the wastewater system, while Veolia is paid more than $40 million a year to operate the water company. The wastewater system currently has outstanding long-term bond debt of $461 million; the water company is carrying $843 million in long-term bond debt. An acknowledged role for the broad array of local talent including those that are minority, women and veteran-owned companies. When the City contemplated the purchase of the water company in 2002, many wise observers suggested that the water company should be owned by a public benefit trust like Citizens Coke & Gas instead of the City of Indianapolis, if the community desired to prevent an outside foreign interest from acquiring the utility. That option would not have permitted all of the skimming and kickbacks that attended the more than half-billion dollar purchase orchestrated by the corrupt administration of Bart Peterson so it was ditched in favor of a city purchase at approximately double the purchase price of the water company's actual value. Although Peterson promised the purchase would ensure low water rates for the City's residents and job protection at the same benefit levels for the water company's employees, both commitments were broken. The City, instead, turned over the management of the water company to Veolia, which was represented by high-powered lobbyists with close ties to Peterson. Water rates are skyrocketing to pay for bungled borrowing schemes and Veolia's overly-generous operating agreement, and the water company employees saw a significant change in their pay and benefits to their detriment. Hopefully, the City can salvage the financial morass with which the Peterson administration saddled the Ballard administration to limit the long-term damage as much as possible. Doing what the City should have done from day one could be the best solution to this problem. There are only two requirements to be eligible to serve as president of the United States under Article II, Section 5 of the U.S. Constitution: you must be at least 35 years of age; and you must be a natural born citizen. There is no federal law, however, that requires a presidential candidate to prove he or she meets those two constitutional requirements. Presidential candidates who file statements of candidates with the FEC and respective state election authorities need only file an attestation requirement that he or she satisfies the constitutional requirements. In practice, state election authorities have bounced from state election ballots in the past third party candidates who failed to meet one of the requirements, but no major party candidate has been similarly denied access to the ballot despite issues raised about their eligibility. To remedy this gap in enforcement of the constitutional requirements, U.S. Rep. Bill Posey (FL) earlier this year filed HR 1503, which would require presidential candidates to file with the FEC a copy of the candidate's birth certificate, together with any other evidence as may be necessary to establish the qualifications for eligibility under the Constitution. U.S. Rep. Dan Burton (D-IN) has signed on as a co-sponsor of the legislation. Radio talk show host Abdul Hakim-Shabazz, who is doing the bidding of Burton primary opponent and Ice Miller lobbyist Luke Messer, instinctively seized on Burton's co-sponsorship of HR 1503 as something to be mocked. "In other words, Burton has joined the Obama 'not really a citizen and why won’t he show us his birth certificate even though if we saw it we would call it a fake' crowd," Shabazz opined. You and I already know what a hypocrite he has become. Contrast his latest comments with his view on Indiana's Voter ID law. Shabazz thinks citizens casting votes in elections should be subjected to greater evidentiary requirements than presidential candidates' evidentiary requirements. "There's always some incidental costs to voting — you can't come to the polls naked," an Indianapolis law professor, Abdul Hakim-Shabazz, who served on the task force that wrote the rules, says. "The remarkable thing is that for all the talk of disenfranchisement, Indiana has had seven elections since, and those challenging the law have yet to turn up a plaintiff who credibly can say the law stymied him," Mr. Hakim-Shabazz says. No, he is not an Indianapolis law professor, but you get the point. If you want to get a license to drive in Indiana, the requirements imposed by the Bureau of Motor Vehicles are even greater. The BMV requires you to produce the following: one document proving your identity; one document proving your social security number; one document proving your lawful status in the U.S. (e.g., birth certificate, U.S. passport, consular report of birth abroad or green card); and two documents proving your Indiana residence. Yes, we impose tougher document requirements on driver's license applicants than we do presidential candidates. The irony is that those same BMV workers who issue driver's licenses also register new voters. During a meeting of the Indiana chapter of the American Immigration Lawyers Association with BMV officials this week, local immigration attorneys, including me, discussed with BMV officials the problem with workers registering non-citizens to vote, which proves quite problematic when an immigration attorney later petitions to make the permanent resident a naturalized citizen. The problem is that BMV workers are not properly trained to ask only U.S. citizens to register to vote. The documentary evidence the license applicant furnishes to them establishes whether they are a U.S. citizen. Nonetheless, BMV workers frequently ask and register non-citizens to register to vote. The Secretary of State's office has no procedures in place to detect these problems, allowing non-citizens to vote in Indiana elections. The BMV thinks the applicant should know whether they are qualified to register, but you have to remember that there are sometimes language barriers and BMV workers do not show the applicants the list of requirements before registering them to vote (i.e. U.S. citizen, resident of Indiana and at least 18 years of age). So when you really think about it, the legislation Dan Burton is co-sponsoring is quite sensible. It's amazing that such a requirement has not been imposed before. Shabazz can go ahead and make fun of Burton all he wants on this one, but I suspect he won't be scoring points for Burton's opponents. They would all be better off if Shabazz just kept his mouth shut and didn't meddle in this election like he did the recent Senate District 30 GOP caucus race. The Indiana Pacers made a horrible business decision in signing a multi-million dollar contract with bad boy Jamaal Tinsley. Now they're paying him $10.7 million of the remaining $14.7 million payments due under his contract. Tinsley has been banned from the team since last season for being a bad boy but has still been getting paid by the Pacers. You can see more about Tinsley's off-court antics as a Pacer player here, here and here. The Indianapolis City-County Council is now considering an ordinance to raise hotel taxes, to siphon off more state tax revenues and to borrow money from the State of Indiana as part of a $25 million a year bailout plan for the financially-troubled Capital Improvement Board. The Board has already announced it plans to give an additional $15 million a year subsidy to the Simon-owned Pacers because the billionaire Simon brothers claim they are losing money on the franchise. The CIB bailout resolution will be heard by the Rules & Public Policy Committee on July 28 beginning at 5:30 p.m. in room 260 of the City-County Building. Chew on that, Indianapolis City-County Councilors, as you consider this latest tax, spend and borrow scheme. Look your constituents in the eyes and convince them this is something you must do to save 65,000 hospitality jobs. Good luck. To pay for a shiny new downtown hospital, the parent corporation of Wishard Health Services will commit itself to yearly debt payments 10 times as high as they are now. But Wishard officials have no doubt they can bear the extra load because of places like Rosewalk Village, a nursing home that sits on the eastern side of Indianapolis . . .
Health & Hospital’s nursing homes last year threw off $43 million in cash. Now the organization can apply that money to the new $754 million hospital, which will re- quire annual debt payments of $38 million to $42 million. “We have bought some of the worst nursing homes in the state of Indiana and turned them around,” said Health & Hospital CEO Matt Gutwein, noting that his own grandmother lives in one of the group’s nursing homes. Health & Hospital announced July 12 that it would borrow up to $703 million to build a new Wishard hospital on the IUPUI campus, replacing its aging complex of 17 buildings at 10th Street and University Boulevard. Gutwein is taking great pains to demonstrate Health & Hospital’s financial strength because he needs voter approval to borrow the money to build the hospital. And he’s promising that Health & Hospital, which is partly supported by Marion County property tax revenue, will have no need for a tax increase. Wall's story makes Gutwein out to be a financial wizard for supposedly turning around the deficits at Wishard because of his wise investments in a nursing home chain empire. He completely ignores the hundreds of millions the federal and state governments have contributed to Wishard Hospital over the past several years in Medicaid disproportionate share payments to help offset uninsured cases not otherwise covered by Medicare/Medicaid or private insurance, not to mention the tens of millions dollars in property taxes sent to him annually. Efforts at the State House to share some of those payments with Community East Hospital, which is experiencing an increasing number of indigent patients, were thwarted by lobbyists for HHC and Clarian, which also grabbed hundreds of millions of dollars of these payments for Methodist Hospital in recent years. At a recent council hearing, Gutwein raised questions about Community East's financial viability, omitting the fact that Wishard and Methodist hog all of the disproportionate share payments to Marion County. Hall's story references "enhanced payments" HHC receives, without describing their purpose. One source complained to me that Clarian relied on those indigent care funds, in part, to help pay for the costly monorail it constructed to connect Methodist Hospital with the IU/Wishard medical campus at IUPUI. Wall discusses the HHC's Rosewalk Village as a shining example of how the HHC is committed to "quality above net profits." Nowhere in his story does he mention the recent closing of Lockefield Villages, a nursing home adjacent to Wishard which the HHC only built in the mid-1990s. That facility only had a one star rating out of a possible five star rating from Medicare at the time of its closing. Wall also boasts of the fact that HHC is earning profits of 17% of revenue before depreciation, amortization and interest are taken into account. Missing from that boast is the fact that HHC is removing hundreds of millions of dollars in assessed value from the property tax rolls at a loss to local units of government across Indiana and is not paying any income or sales taxes. I think I could make healthy profits on just about any business if I didn't have to worry about paying taxes to the government. Matt Gutwein is no business genius. He's just very effective at using our tax dollars as leverage to bilk more money out of the government. The question that should be asked is why we are allowing him and the HHC to diverge away from their mission of providing indigent care to Marion County residents and towards the building of a statewide health care empire? Among Indiana's 150 legislators, House Speaker B. Patrick Bauer, D-South Bend, led the list, receiving more than $5,200 in trips and dinners . . . The gifts to Bauer included a $2,900 trip to San Juan, Puerto Rico, to speak to the Indiana Motor Truck Association, and two nights at a Washington, D.C., hotel costing about $1,100, to attend President Barack Obama's inauguration, courtesy of Roche Diagnostics. AT&T -- which had not courted Van Haaften in any prior session -- flew him to San Antonio for a Pro-Am golf tournament, gave him a $350 gift card for the pro shop, and hosted him and his wife at an inaugural ball in Washington, D.C. Altogether, AT&T lavished more than $4,200 on Van Haaften. Combined with another $100 in golf from Evansville-based utility company Vectren, VanHaaften received the second-most in lobbying largesse. The bill easily passed. One lawmaker, Sen. Greg Taylor, D-Indianapolis, found all of his smaller meals itemized in the reports -- 29 meals ranging from $4.25 to $83.23 -- totaled $713.67. All were paid for by a single lobbyist -- Joseph Smith of Baker & Daniels. Smith did not return phone calls, but Taylor said the meals were about friendship, not lobbying. Smith is a neighbor and college friend. Taylor said he's picked up plenty of Smith's checks, too. Still, he admitted some surprise at the total. It didn't take Sen. Taylor long to get on the lobbyist gravy train. He's in his first elected term to the state senate and he accepted 29 meals from the same Baker & Daniels lobbyist? Pat Bauer's thousands of dollars in freebies is no surprise. He's used his legislative leadership position as a cash cow for years. And Van Haaften? What can you say. The guy has been bought and paid for by AT&T, pure and simple. Also, Senate Democratic Leader Vi Simpson tagged along with Bauer to the Motor Truck Association's trip to Puerto Rico according to the newspaper's database. Schneider just didn't single her out at least in the online version of her story. Schneider's story notes efforts by Sen. Mike Delph to provide greater transparency in reporting of lobbyist expenditures on behalf of legislators. He wants everything with a value of $25 or more reported. Some states ban entertainment spending by lobbyists on behalf of legislators altogether, which is the preferred route. Delph has put his money where is mouth is by self-reporting such expenditures on his website. As a former lobbyist, I'm very familiar with how the game is played. I've studied closely the reports filed by lobbyists that I have personally observed wining and dining certain legislators at expensive restaurants and handing out free tickets to them and their family members to Colts and Pacers games. I believe some of these high-roller lobbyists are flat out lying on their lobbyist disclosure statements. I distinctly remember giving Colts tickets to a legislator who gladly accepted them and then threw a fit when I reported them as a gift exceeding $100. I got the distinct impression from his reaction that other lobbyists didn't follow the rules and he didn't expect me to do follow them. There are some gaming lobbyists, in particular, who hang out at the Columbia Club who break all the rules on a regular basis and have no fear of getting caught. Lobbyists are regulated by the Indiana Lobby Registration Commission, or as I like to call it, The Lobbyist Protection Commission. The commission members are appointed by lawmakers with a wink and a nod, who make sure the commission staff lacks the resources to do any real investigation of potential wrongdoing. I wasted my time filing a complaint once against a lobbyist who was obviously violating the law. The Commission refused to accept the complaint unless I filed it with enough copies for each commission member and the staff, even though there were no formal complaint procedures provided to the public to explain this requirement. After a behind-closed-door meeting with the lobbyist, the Commission dismissed the complaint without conducting any investigation to determine if the alleged violations had occurred. Indiana legislators are bought and paid for daily by lobbyists through free sporting event and concert tickets, free trips, free golfing opportunities and free meals and drinks at the finest restaurants in town. The legislative leadership scorns lawmakers like Sen. Delph who want to air out the stench that fills the hallways at the State House. Until there is some meaningful ethics and lobbying reforms at the State House, the public has every reason to suspect that their lawmakers are up to no good on their dime. The state's former Chief Justice, Richard Givan, who served on the Indiana Supreme Court for 26 years, died yesterday at the age of 88. The Star's Diana Penner has a nice reflection on his career here. The obituary in the Star can be accessed here. I had the pleasure of sitting on several initiation panels with Givan at the Indiana Supreme Court chambers for my legal fraternity, Phi Delta Phi. Givan always had some great insights on the Court to share with laws students at Indiana University School of Law-Indianapolis, as well as plenty of funny stories he experienced from nearly a half-century of work in and around the Court. Perhaps nobody in Indiana had more institutional knowledge of the Court than Givan. One of my favorite Givan lines was this: "Chief Justice Shepard likes to talk about the first minorities to serve on this Court. Well, I'm about as much of minority as you can find in Indiana. I'm a Quaker." Riding a wave of anti-establishment sentiment, former City-County Councilor Scott Schneider reignited his political career tonight with a convincing second-ballot win of 61-38 over City-County Councilor Ryan Vaughn at the Senate District 30 caucus to replace Sen. Teresa Lubbers. Schneider fell just one vote short of winning on the first ballot, receiving 49 votes to Vaughn's 37 votes and former State Rep. John Ruckelshaus' 12 votes. Schneider captured all of Ruckelshaus' votes on the second ballot, discounting one spoiled ballot on the first round of voting. Schneider delivered the most soft-spoken speech tonight among the three candidates, emphasizing his commitment to less taxes, fiscal restraint and individual responsibility. Schneider told committepersons he was the one candidate who they could count on to return their calls and represent their interests above special interests. State Rep. Cindy Noe delivered a ringing nominating speech for Schneider. Many had thought Noe would seek the seat which has been held by a Republican woman for decades now; however, she deferred to Schneider because of the support he and his family extended to her in her run for state representative. City-County Councilor Mike McQuillen delivered a strong nominating speech for Vaughn. Several of his fellow Republican councilors were on hand tonight to support his candidacy. Mayor Greg Ballard, who endorsed Vaughn in a letter to committeepersons last week, did not appear at tonight's caucus. Vaughn emphasized his prosecutorial experience, council experience and State House lobbying experience. Ruckelshaus delivered the most rousing speech of the three after he was nominated by Rick Hurst. He emphasized his past state legislative experience and state government experience, as well as his private business experience. He told committeepersons he was the best candidate to pick up the ball left behind by Lubbers and lead on key issues like charter schools. In the end, committeepersons appeared determined to pick the outsider, anti-establishment candidate and Schneider best fit that bill tonight. State GOP Chairman Murray Clark and the GOP staff did an excellent job conducting what everyone viewed as a very fair election tonight. An Internet report by radio talk show host Abdul Hakim-Shabazz, a Vaughn cheerleader, that Schneider was challenging the certification of several committeepersons proved to be overstated. The issue was whether two vice committeepersons could vote in place of precinct committeepersons who had moved out-of-state recently or were otherwise unavailable. the party certified them to vote, although it wasn't clear that the two persons in question even showed up to vote. There were 99 votes certified out of a potential 107 eligible votes. The losing candidates, although deflated, congratulated Schneider on his victory. Chris Douglas, who dropped out before the voting started tonight, also did himself well with the few remarks he delivered, conceding that the votes were simply not there to make the run. Star reporter Vic Ryckaert questioned me about any concerns I might have with Schneider's win given his opposition to the Human Rights Ordinance as a councilor. I disagreed fervently with the position Schneider took on that vote at a time when the Marion Co. GOP Chairman was urging Republican councilors to vote in a bloc against the HRO. In the end, only two GOP councilors supported it. In defense of Schneider, I pointed to his independence on the council and his steadfast opposition to some of Peterson's most-costly blunders, including the purchase of the Indianapolis Water Company. Few would doubt that everything he said at the time for opposing that purchase has proven true today. Schneider also opposed consolidating the police and sheriff's department under the sheriff. Council Republicans agreed with his view and reversed that action, moving control of IMPD back to the Mayor's office. Schneider also consistently voted against the Peterson tax increases. One final comment I will make is that this race tonight had nothing to do with social issues. To the extent any issues drove the debate it was the desire of committeepersons to return to the bread and butter economic issues that has driven Republican successes in the past. The anti-establishment sentiment hurt Vaughn and Ruckelshaus because they are both registered lobbyists. Schneider's greatest asset may have been his ability to connect one-on-one with committeepersons. Several committeepersons, who met with each of the candidates, have made this point to me over the past several weeks. And all is not lost for Vaughn. He probably stands a good chance of succeeding Bob Cockrum as CCC President next year, assuming Barb Malone doesn't jump ship and return to the Democratic Party, which is not out of the realm of speculation at this point. If that would happen, Republican-turned Libertarian Ed Coleman could hold the deciding vote. For the political junkies interested in the breakdown of how the committeepersons voted geographically, here's what I learned. Schneider won in Hamilton County, the northeast region and even the southern region of the district home to Vaughn's council district. Schneider collected 14 votes from Hamilton County, while Vaughn and Ruckelshaus split five votes each on the first ballot. Schneider collected 18 votes in his home area compared to 7 votes for Vaughn and 5 votes for Ruckelhaus. In Vaughn's home area, Schneider collected 25 votes to Vaughn's 17 votes and Ruckelshaus' 2 votes. One final aside, I see Jim Shallow has declared Schneider's election tonight a win for the "far right." For the record, the reporter in question was a no-show at tonight's caucus. You know, he didn't want to work past 5:00 p.m., and that's how his insider, elititist pals at the State House told him to report on the outcome. Great job, Jim. So much for the claim of being the best State House reporter. Scott Fluhr has a good analysis of tonight's race at Hoosier Access here.